A special virtue of this section of the Liturgy is that it is an opportunity for members of the Church to pray for one another. When I was younger, I understood the Confiteor, along with the Kyrie eleison, Christe eleison (Lord have mercy! Christ have mercy!) which comes later, as being mainly concerned with seeking forgiveness for ones own sins. But with age comes a growth in instinctive concern for others; you look around and see what difficulties and burdens others bear, and, if you have a heart, you naturally want them to be helped. As this charitable concern develops, the Mass takes on new meaning and importance. Just think of what the verse above implies. Look at the suffering and the burdens others bear — whether those be their sins, or the consequences of those sins, or the guilt and shame their sins produce. And then consider the possibility that you may be an agent in removing those burdens and effecting their healing. Have you never noticed how real benefits may come to others as the result of your prayers? What if no-one else on the entire the planet is praying for these individuals? That may easily be the case! Can you not bring yourself — indeed, can you not resist the compassionate urge — to pray for them? To give a personal example, suppose I’m at Mass and I see people in the congregation with serious obesity problems; these days, I’m afraid, that’s an all too common experience. Now God has given me the gift of physical fitness and a strong personal motivation to exercise. This is a grace not everyone has. It is a blessing, and I’m extremely grateful for it. But I have been overweight before, and therefore know that these people suffer very much because of obesity. It’s perfectly natural, then, for me to pray for them. Now it might be objected, “Aren’t you being judgmental here? On what basis are you apparently equating their health issues with sin?” The answer is that I’m taking a very broad view of sin; it might be better to call the issue here moral imperfection, or even an insufficiency of moral strength. We need to strip ‘sin’ of its judgmental connotations in any case. The original Greek word for sin is hamartia, which means ‘missing the mark.’ It’s appropriate, then, to see the alleviation of obesity, depression, substance abuse, or many other things people suffer from as subjects of prayer in the Penitential Rite. May Almighty God have mercy upon you, forgive you your sins, and bring you to life everlasting. May the Almighty and merciful God grant us pardon, absolution, and remission of our sins. This detail actually signifies something momentous: that the priest and congregation, symbolized by the assistant(s), are praying, interceding with God, for each other’s forgiveness. The present form of the Roman Catholic Mass includes only one Confiteor, said jointly by the priest and congregation. In theory, nothing has changed spiritually: all are praying both for themselves and for each other. But the present liturgy leaves this more ambiguous. If not instructed in the matter, people may misunderstand, and think they are only praying for their own forgiveness. 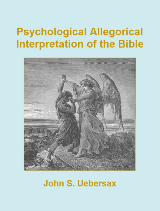 At one level, it’s perfectly understandable and ordinary for people to be so intent on confessing their own sins and seeking forgiveness that the reciprocity of the Confiteor escapes attention. Yet Christians in this respect are called on to be more than ordinary. They are called to be priests, a priestly people (1 Peter 2:5–10; cf. Exodus 19:6); and one vital function of a priest is to intercede with God for the welfare of others. Note that we are not just called to forgive those who have trespassed against us, but also those sins others commit that might not involve us at all. Sometimes we might think that the connection between forgiving and forgiveness is merely a kind of reciprocal justice: if we forgive, then we’ve done a good deed, and our reward is to be forgiven in exactly the same degree. But the connection is actually much stronger. In a sense, our holding onto grudges, or even just a ‘stinginess’ in wishing forgiveness for anyone, automatically carries with it a burden of moral imperfection, if not outright sin. Said another way, the moment we earnestly pray for others’ forgiveness — not just those who have harmed us, but those who need forgiveness in any way and for any reason — we ourselves come into right relation to God and with ourselves. And whatever burdens we have imposed on ourselves by being out of right relation are removed. This shouldn’t be taken to imply that an awareness of our own sinfulness isn’t terribly important. Quite the opposite: the more cognizant we are of our need for forgiveness, the more enthusiastic and willing we are to forgive others, as this is a small price to pay indeed. If we fully understood this principle, we would beg and thank God for the opportunity to forgive others! Perhaps at this point some will expect me to suggest that we should restore the Tridentine Mass, but that is by no means my point. In fact, I think the liturgical changes have been, in the main, for the better. It seems sufficient for the Confiteor to be said once — provided that people are aware of all that’s going on. I believe it proper to say that the main focus of ones prayer here should be for others’ forgiveness. That is the object of our prayer. The action of our praying for others is itself implicitly the prayer for our own forgiveness — so that both needs are being met at the same time. I do believe, however, that, with the present liturgy, special attention needs to be given to instruct people about the dual nature of the Penitential Rite. Further, some things I’ve read online seem to suggest that in certain diocese and/or at certain times, the Confiteor is omitted from masses. If so, then it seems to me very important that whatever is used in its place emphasize and encourage the dual aspect of praying for forgiveness. I wrote at the outset that this is something momentous, but have yet to fully explain why. Consider this principle of each forgiving another — of striving to do this oneself, and of coming to regularly expect that others approach you in the same way — carried to its logical extreme. That is, imagine a society where this principle became conventional, usual, regular. In that case the whole orientation of the individual towards others and society in general would be transformed, and for the better. Inasmuch as the ability to heal by forgiving is natural, and human beings are naturally social and gregarious, then an ambient recognition of this principle would amount to a revolution in human consciousness, individual and social. We would achieve in practice what is yet only latent and dormant in our collective potential. We would change as a species. From Chapter 2 (pp. 25 – 31) of The Holy Sacrifice of the Mass by Fr. Martin von Cochem, OFM Cap (1630 – 1712). Translated by Rev. Camilus Paul Maes, Bishop of Covington, Kentucky). New York, 1896. First of all, the great excellence of the holy Mass may be inferred from the prayers and ceremonies appointed for the consecration of churches and altars. Any one who has been present at the dedication of a church, who has followed the prayers and understood the ceremonial made use of by the bishop, cannot fail to have been edified by what he witnessed. For the benefit of those who have never assisted at the consecration of churches and altars the ceremonies connected with it shall be briefly described. He next goes three times round the interior of the church, sprinkling the walls above, below, and in the middle whilst three psalms and antiphons are sung. He also sprinkles the floor of the church in each of the four corners, with certain prayers and the sign of the cross, and returns to the high altar. He then blesses chalk and sand, and mixes them with holy water, thus preparing the mortar for the laying of the altar-stone. Afterwards, going in procession to the place where the relics were deposited on the previous evening, he incenses them, and carries them with lighted tapers and smoking censers round the church. Pausing on the threshold, the bishop makes three crosses on the door, saying: ” In the name of the Father +, and of the Son + , and of the Holy + Ghost, be thou blessed, sanctified, and consecrated. When the procession reaches the high altar, the bishop makes five crosses with chrism in the cavity of the altar, called the sepulchre, places the case containing the relics in it, incenses them, and closes the repository or sepulchre with a stone that has been blessed and the mortar prepared for the purpose. Thereupon he incenses the altar itself, and hands the censer to a priest, who goes round it incensing every part. Meanwhile the bishop makes five crosses with oil of catechumens on the table of the altar, one in the centre and one in each of the corners, with the same words employed when blessing the water, incenses the crosses, and goes round the altar incensing it. After the prescribed prayer and psalm have been recited he again anoints the altar, making five crosses upon it, saying: “Let this altar be blessed, sanctified, and consecrated.” He then again incenses the crosses and the whole altar. This ceremony is repeated a third time, whilst psalms are chanted by the clergy. Finally, the bishop pours oil and chrism over the whole altar, rubbing it in with his hand. He then goes round the interior of the church, and anoints the twelve crosses upon the walls with the chrism, saying: “Let this church be hallowed and consecrated in the name of the Father, etc.,” and incensing each cross three times. Returning to the altar, he blesses the frankincense, lays five grains of incense wherever the five crosses were made, forms five small crosses out of wax tapers and lights them. Whilst they are burning, he kneels down, as do all the clergy present, and intones the hymn Veni, Sancte Spiritus. This is followed by more prayers and a preface; the clergy chant Psalm Lxvii. in thanksgiving for the graces received; the bishop makes a cross with the chrism below the table of the altar, and recites more and longer prayers. After that he rubs his hands with bread and salt, and washes them in water. The clergy wipe the altar with linen, cover it with an altar-cloth, decorate it as best they can, whilst psalms and responsories are sung. In conclusion the bishop incenses the altar three times, and proceeds to celebrate a solemn pontifical High Mass. All who have been present at the dedication of a church cannot find words to express their surprise at the number of different ceremonies, anointings, benedictions, and prayers that appertain to the ritual. What is the object of all of these ? It is in order to render the church a temple meet for the great and holy sacrifice offered up therein to the most high God, and to hallow and consecrate the altars whereon the spotless Lamb of God is to be slain in a mystical manner. Who, indeed, can fail to be amazed at this, and feel himself unable rightly to comprehend the dignity of that sacred temple ? And yet that temple was but a type, an image, of our churches. In that there was nothing but the Ark of the Covenant, which only contained the two stone tables of the law, a basket of showbread, and Aaron’s rod that had blossomed. The sacrifices of the Jews were only animals that were slaughtered and burnt, besides offerings of bread, wine, cakes, etc., whereas our churches are dedicated by the bishops with incomparably greater solemnity; they are anointed with holy oil and chrism; they are blessed by being sprinkled with holy water and incensed with frankincense; they are hallowed repeatedly by the sign of the cross, and consecrated finally by the oblation of the most holy sacrifice of the Mass. Instead of the Ark of the Covenant we have the tabernacle, where the true bread of heaven, the adorable Sacrament of the Altar, the body and blood of Christ, is continually reserved. If it is right to hold Solomon’s temple in honor, how much more ought we to reverence our consecrated churches, in which God dwells in person. From all this we learn the sanctity of our churches, and the respect we owe to them. It is because they are the house of God, and Jesus Christ dwells in person within them in the Blessed Sacrament, surrounded by innumerable angels, that we know not how to honor them enough, how to be sufficiently devout and recollected in prayer. If we had a living faith, we should enter a consecrated church with trembling; we should worship Christ present in the Adorable Sacrament with deepest reverence, and invoke the assistance of the holy angels who are there. Such was David’s custom, as he tells us in the words: “I will worship towards Thy holy temple; I will sing praise to Thee in the sight of the angels.” (Ps. cxxxvii. 2, i.) Therefore to be inattentive in church, or in any other way to displease God by disrespectful behavior, is an insult to the Divine Majesty and dishonor to the house of God. Let us firmly resolve on entering a church not to utter or listen to an unnecessary word, nor to look about us, but to behave reverently, to pray devoutly, adore the Lord our God, to confess our sins and implore the divine mercy. He next goes three times round the interior of the church, sprinkling the walls above, below, and in the middle whilst three psalms and antiphons are sung. He also sprinkles the floor of the church in each of the four corners, with certain prayers and the sign of the cross, and returns to the high altar. He then blesses chalk and sand, and mixes them with holy water, thus preparing the mortar for the laying of the altar-stone. Afterwards, going in procession to the place where the relics were deposited on the previous evening, he incenses them, and carries them with lighted tapers and smoking censers round the church. Pausing on the threshold, the bishop makes three crosses on the door, saying: ” In the name of the Father +, and of the Son +, and of the Holy + Ghost, be thou blessed, sanctified, and consecrated. 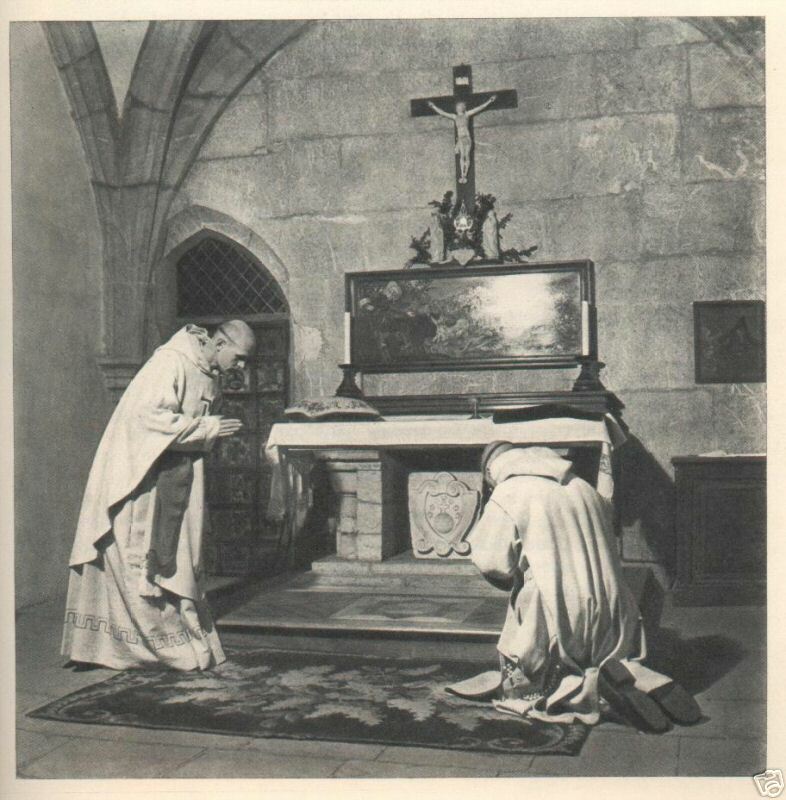 When the procession reaches the high altar, the bishop makes five crosses with chrism in the cavity of the altar, called the sepulchre, places the case containing the relics in it, incenses them, and closes the repository or sepulchre with a stone that has been blessed and the mortar prepared for the purpose. Thereupon he incenses the altar itself, and hands the censer to a priest, who goes round it incensing every part. Meanwhile the bishop makes five crosses with oil of catechumens on the table of the altar, one in the centre and one in each of the corners, with the same words employed when blessing the water, incenses the crosses, and goes round the altar incensing it. After the prescribed prayer and psalm have been recited he again anoints the altar, making five crosses upon it, saying: “Let this altar be blessed, sanctified, and consecrated.” He then again incenses the crosses and the whole altar. This ceremony is repeated a third time, whilst psalms are chanted by the clergy. Finally, the bishop pours oil and chrism over the whole altar, rubbing it in with his hand. He then goes round the interior of the church, and anoints the twelve crosses upon the walls with the chrism, saying: “Let this church be hallowed and consecrated in the name of the Father, etc.,” and incensing each cross three times. Returning to the altar, he blesses the frankincense, lays five grains of incense wherever the five crosses were made, forms five small crosses out of wax tapers and lights them. Whilst they are burning, he kneels down, as do all the clergy present, and intones the hymn Vent, Sancte Spiritus. This is followed by more prayers and a preface; the clergy chant Psalm Lxvii. in thanksgiving for the graces received; the bishop makes a cross with the chrism below the table of the altar, and recites more and longer prayers. After that he rubs his hands with bread and salt, and washes them in water. The clergy wipe the altar with linen, cover it with an altar-cloth, decorate it as best they can, whilst psalms and responsories are sung. In conclusion the bishop incenses the altar three times, and proceeds to celebrate a solemn pontifical High Mass. From all this we learn the sanctity of our churches, and the respect we owe to them. It is because they are the house of God, and Jesus Christ dwells in person within them in the Blessed Sacrament, surrounded by innumerable angels, that we know not how to honor them enough, how to be sufficiently devout and recollected in prayer. If we had a living faith, we should enter a consecrated church with trembling; we should worship Christ present in the Adorable Sacrament with deepest reverence, and invoke the assistance of the holy angels who are there. Such was David’s custom, as he tells us in the words: “I will worship towards Thy holy temple; I will sing praise to Thee in the sight of the angels.” (Ps. cxxxvii. 2, i.) Therefore to be inattentive in church, or in any other way to displease God by disrespectful behavior, is an insult to the Divine Majesty and dishonor to the house of God. Let us firmly resolve on entering a church not to utter or listen to an unnecessary word, nor to look about us, but to behave reverently, to pray devoutly, to adore the Lord our God, to confess our sins and implore the divine mercy. It is instructive to consider the various names of God used in the Catholic Mass. The list below comes from the regular Order of the Mass, variable Eucharistic Prayers I — IV, and variable Eucharistic Prayers for Masses of Reconciliation I — II, as shown on the web pages of Felix Just S. J. .
All life, all holiness comes from you through your Son, Jesus Christ our Lord, by the working of the Holy Spirit.